A series of projects utilsing books and the printed page. Books are treated as a piece of sculpture to be altered or manipulated by cutting and carving into the paper layers. Cut out elements can then be re- constructed into paper designs independent of the book with the fragmented text offering a decorative element to the design or piece. 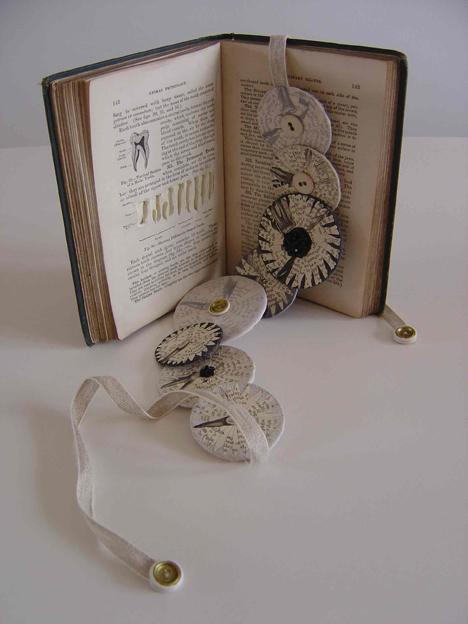 Hand cut Altered Book and Tooth Neckpiece made from cut out collaged teeth from the book. Junior Pears Encyclopedia 1968, updated 2009. Hand Cut, Stitched and Constructed Book. The Bookworm riddles its way out of the book, eating away at the paper to disrupt the reading of the text; metamorphosis’s into a bobbin or spool (of thread), stealing matter and meaning from the book. 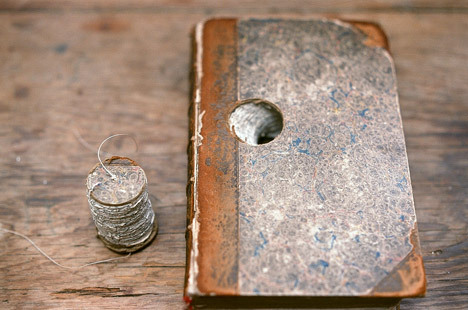 Other found, familiar or unusual objects that bare a relation to the subject matter within books can be used to make an altered book work.